I'm a big fan of Lush Cosmetics! from amazing handmade Bath Bombs to gorgeous Face and Hair products, you're sure to find something you will love! They also fight against animal testing which is great! 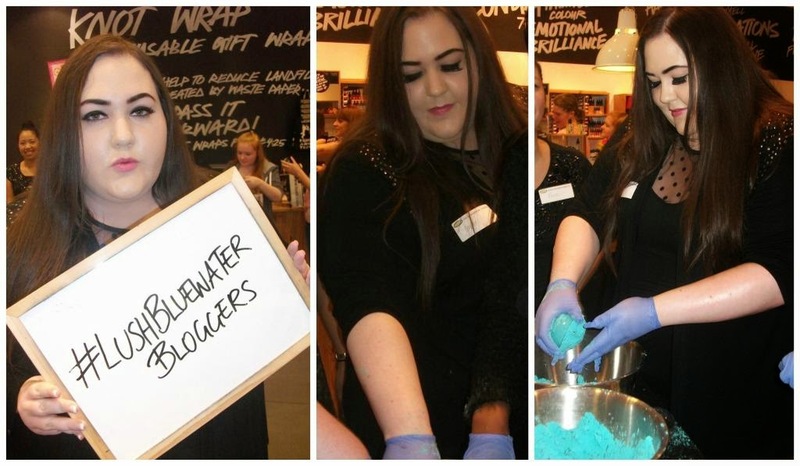 On Sunday the 17th of August 2014 I was lucky enough to attend a V.I.P Bloggers Event at The Lush Bluewater Store. I had my own special password for the event and on arrival I was greeted by the most friendliest of staff with a gorgeous Orange Juice drink that had aloe vera in it! So the day started with the Lush Team giving us demonstrations on how to use products such as The Sunblock. This new product protects your skin from the sun, apply to damp skin and pat dry. The Sunblock has 12 ingredients such as cocoa butter, rose absolute and calamine powder, it's also great for delicate skin. You can also use it throughout the day without using any water. It felt lovely on my skin and glides on so smoothly! Now for the Messy bit! I got to make my very own Bath Bomb, this was absolutely fantastic! My bath bomb is currently setting, I can't wait to use it! I adore watching Bath Bombs fizz, there's something really relaxing about it! The Lush team then spoke to us about a mixture they use to create Mermaid water. Here's a little video of the Bath Bomb melting! heaven! Lush very kindly gave all the Bloggers a goody bag with a book of all the products which I thought was sweet of them. Lush Cosmetics also have a range of perfume. I got to pick a solid perfume, you could either have Karma or Vanillary, I went for Vanillary as it has a sweeter smell. It was such a fabulous day and everyone was so lovely! It was also nice to meet some other Bloggers! What's your favourite Product from Lush?